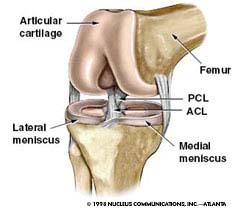 ACL stands for anterior cruciate ligament. It is one of the main ligaments that run through the center of the knee, and functions to stabilize the knee joint. It connects from the posterior-lateral portion of the femur to the anterior-medial part of the tibia. The ACL works in conjunction with the posterior cruciate ligament (PCL) to prevent the femur from sliding too far forward or too far backward on the tibia. The ACL also prevents the tibia from rotating or sliding too far during activities that require jumping, sudden stops, or cutting motions. Damage to one of these ligaments severely compromises the person’s ability to carry out pivoting or rotating motions without causing buckling or further damage to the knee. The ACL is comprised of a network of collagen, structural glycoproteins such as fibronectin and laminin, and glycosaminoglycans. Each component helps to contribute to the structural properties of the ligament, but it is the collagen fibers which impart tensile strength to the ligament, and elastic fibers which enable it to stretch and deform without permanent damage. The ability of ligaments to absorb energy is important in preventing energy from being transmitted to the bone and causing possible damage. The size of the ACL varies from person to person, but on average it is 11cm in length and 0.7cm in diameter. Albeit small and flexible, it can withstand forces up to 2000N and has a tensile strength of at least 38MPa. Much of its high strength is due to its aligned type I collagen network which allows it to support large loads with little deformation. Despite its incredible strength, the ACL is the most commonly injured ligament in the human body. This is because the tibia and femur form two long lever arms, leaving the knee joint exposed and prone to injury.